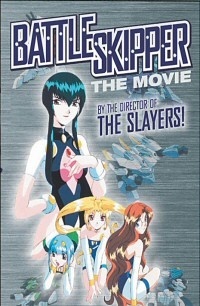 Despite the title, this is not a feature but the three-part OAV Battle Skipper (1995), which Takashi Watanabe directed before going on to Slayers. When the members of the Etiquette Club at St. Ignacio's School for Girls go down the tubes--literally--they acquire the skimpy outfits they wear to pilot the unfortunately named BSs or Battle Skippers, state-of-the-art military mecha. As "Extars," the Etiquette Club members fight to eliminate evil from the world, which means the bizarre schemes of Sayaka, the nasty, super-rich president of the rival Debutante Club, and her flunky, Todo. The series was created to promote a line of robot toys from Tomy, and viewers who are willing to accept high school girls' quarrels escalating into battles involving satellite weaponry may enjoy these silly adventures.